NB: If you received a new license for an existing licensed setup (where no changes were made in terms of what is installed where or used on which computers, skip to Renewing a license file (on an existing license server). Legal software and licensed features needs a license to run. The way in which a software package reads a license to determine whether a valid license exist for the function you are using, is by looking for a license server which contains the license file. Such licenses normally has an expiry date and has to be renewed annually or as determined by your contract with the supplier. The license(s) you have will determine where it has to be installed. If you are unsure how to determine that, see this step under troubleshooting: . The computer on which the license needs to be installed is called the "license server" and this can be your own notebook, desktop or a central computer on your company's network. For most companies, where more than one user is licensed to use the software, a single license will be provided and this license will then be installed on a central computer on the network. This can be a big server computer, the secretary's computer or any one of your work stations, as long as all the users have access to it through the network. The computers where the licensed software will actually be used (which may also be the same "license server" machine, are called the "client computers" and they have to be setup to know where the license is in order to allow you to run your licensed software. The image below shows the two scenarios where a single machine is both server and client machine vs. the more common company wide setup where more than one machine are involved in the setup. Renewing a license file (on an existing license server). The following step is the first step that has to be taken before a new license can be issued for the first time for a specific machine, and is also the same step that is required when checking that the license file received was issued for the correct machine or that it is installed on the correct machine. Windows XP: Go to Start, then Run and type: cmd and press Enter. Windows 7 and newer: Go to Start, and in the search field type: cmd and press Enter. This will display the required information in the DOS window as shown below. Find and report the physical Address of the Ethernet adapter Local Area Connection (the Network card), as indicated. In this example the MAC address (or Host ID) is 34-E6-D7-09-6A-C4 (not caps sensitive) as shown below. Provide your SIMTEQ Engineering contact with this code. This will not show the host ID information as above and it will appear as if nothing has happend. In this case, a text file named yournamehostID.txt has been created in the folder shown in the DOS window. The previously shown information will be in that file (open it with NotePad to check) and send this file to your SIMTEQ Engineering contact instead - they will pick the correct address. For this step you should have a license file that has a .dat or .lic extension. This file will only be valid for use on the computer for which you have provided the Host ID earlier. If FLEXLM is already installed on this machine, skip to Renewing a license file (on an existing license server). To configure the license server for the first time, run the installation file of FLEXLM (You can download the latest install file from here. Run the EXE file and for type select "new installation". When asked to specify the license path, select "browse" to find the provided new license file. Select the license file and click Open. Finishing the installation will configure the license server on the computer. This will create a new license file in the install directory specified earlier which will be the license file used for the license server. After configuring the license server on a central network based computer you can point to that license server to use the license on a different computer if the license allows it. Under System variables create a new variable. (For MSC Software Licenses, create the variable "MSC_License_File". NB: The spelling must be identical for the variable name:"MSC_License_File", beware of miss spelling it, but captilization is not important. The license-server must be the computer name (as used on your network (or its IP address)) of the license server (where you installed FlexLM). Step 1: Choose the service for which you have a new license (if you have more than one supplier using LMTools). Step 2: Click on "Server Status" and note which is the current license file being used. Locate that license file and rename it to license_old.dat. Copy the new license into the same folder and rename the new license file to License.dat. Open the new license file, using a text editor such as notepad. In the first lines of the new license file, notice that next to server is written "this_host" and next to Daemon MSC is written "/your_path/msc". In the Start/Stop/Reread tab, check the Force Server Shutdown option and select Stop Server. Select Start Server to start the license server using the new license. Read the information after "Vendor daemon status". It should show that licenses have been issued. If this is the case, you have successfully renewed your license! In some rare cases, the "Service status" might incorrectly show the status of one of the other license services and NOT the one you picked on the first tab (a dead give away is if the wrong supplier name or products are listed here). If it states somewhere that "The desired vendor daemon is down", then the process was unsuccessful and you will have to check all the steps again. If the problem persists, continue to the next section. Step 2: Follow the procedure to obtain your Computer MAC Address (or Host ID) and check that these two addresses are identical. Ensure that the license has not expired: In the license file you will see two dates for each feature: The first date indicates when maintenance expires after which new versions of software will not run. The second date indicates when the license expires for older versions of the software (issued before the first date). Check your network connection to the license server: On the client computer, open Start and type cmd. In the command window, type ping and the license server computer name and press enter. Use this to confirm a working network connection. 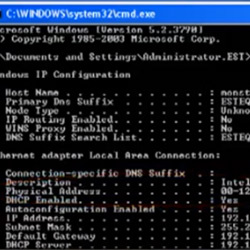 If there is no connection, also type ping and the IP address of the license server computer. If none of these two ping options provide a valid response, there is a network error which has to be resolved by your IT department (also check for loose network cables and that the server computer is switched on. Check that the port specified in the value is the same as that given in the license file as shown in Figure 7 and Figure 8. Check the spelling of the computer name in the variable's value. Check that the correct license is active: On the license server computer, open FlexLM (lmtools) and under Config services check the Path to License File, as well as the license file name. Ensure this is the correct new license. Stop and re-start the lisense server: Under the "Server Status" tab, stop and restart the license server. Chekc the log file for errors: Under the "Config Services" tab, click the "View Log.." button and check the last entries in the log file (this file can also be accessed with a text editor in the set location). Check for any error messages that might indicate what the problem is. Ensure that the date and time-zone of the computer running the license server and the computer pointing to that license server match, as this could cause errors in reading the license file correctly. To check whether all of the licenses are already in use (from the client computer), you are required to have FlexLM installed on your computer as well (Follow the same steps as in Configuring the license server (for the first time) but without supplying a license file). Open start and type cmd to open the command window. type cd and the path to where FlexLM in installed on your computer..
Once the path is changed, type lmutil lmstat -c "license port @ computer" -A where the license port and computer name is the same as the environment variable for that license. An example of this is in Figure 10.